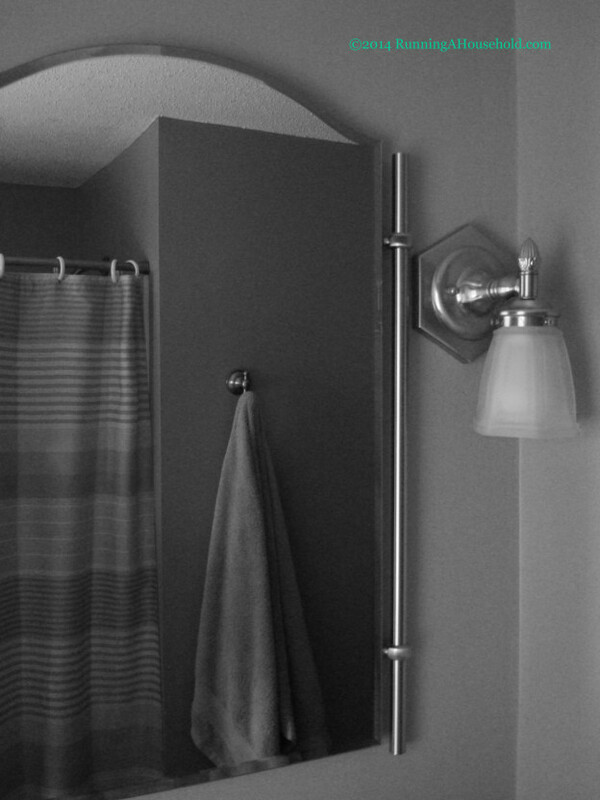 Cleaning and organizing the bathroom is usually part of our spring and fall cleaning routine. Here are some tips to help you with this project. We could all use a little motivation when it comes to cleaning. Tip #1: Sometimes the best advice is to just start cleaning something. Once you start, you’ll want to continue cleaning. Tip #2: Plan to do a little bit of cleaning each day of the week. We all have good intentions, but there’s only so much cleaning we can do in one day. These projects took anywhere from 1/2 hour to 1 hour. By knowing we were only planning to spend up to an hour each day, it was easier to allocate the time, and get the job done. It also meant that we weren’t exhausted from trying to fit it all in on one day. Disclaimer: Some of the links below are referral links, which means that if you make a purchase, there is no extra cost, but Running A Household will receive a commission. I’ve come to the conclusion that I’m not a fan of before-and-after pictures. So, you’ll just have to trust me when I say that the “before” pictures were not photo-worthy. However, we are happy to share our “after” photos with you. 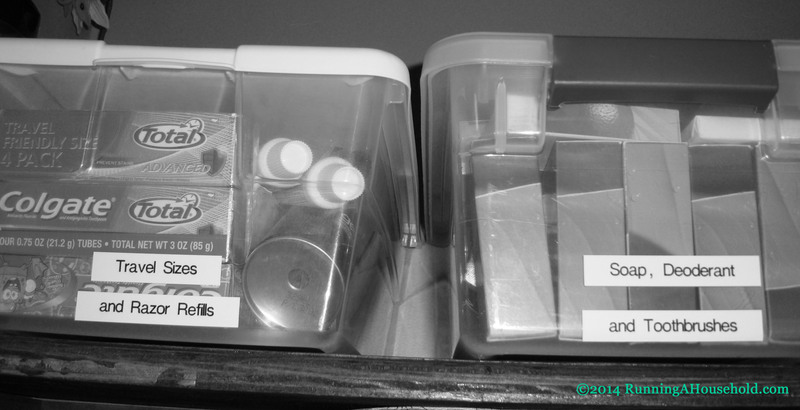 Note: We opted to post the pictures in black and white, so that you can focus on the organizing tools, rather than all of the colors. Organizing Towels: Sometimes just refolding towels and discarding any old ones can freshen up your closet. 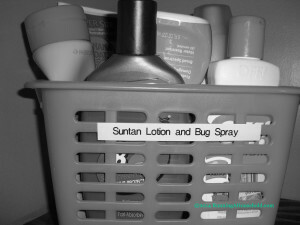 We opted to put our suntan lotion and bug spray in a cute little basket with handles. It’s easy to reach, and everything is there when we need it. 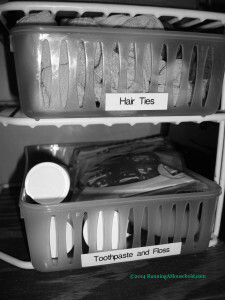 We places a small shelf organizer in our bathroom closet. This makes great use of our vertical space. There’s a small basket to hold all of the hair ties. There’s another basket to hold our toothpaste and floss. On the top shelf of our organizing rack, we placed our small bin with nail polish supplies. There’s room for nail polish, a can of polish dryer, and nail cutting and filing supplies. Have you ever seen the expandable three shelf organizer? We have one in the kitchen, and use it to organize our spices. This shelf works great in the bathroom, too. It makes it easy to see the items in all three rows. We keep our most frequently used items in the front row. 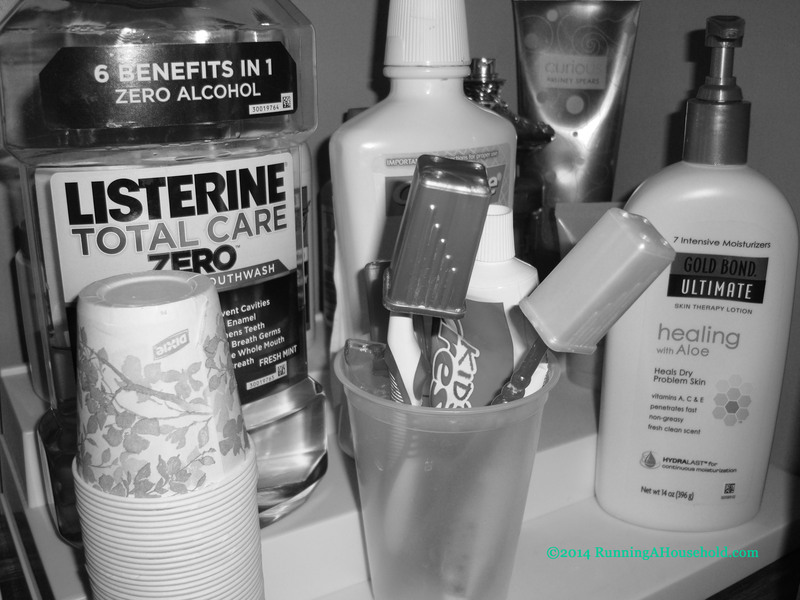 There, you’ll find Dixie cups, toothbrushes, and hand cream. In the next row is our mouthwash and fluoride rinse. We use these daily, but their large size makes them easy to see and reach in the second row. 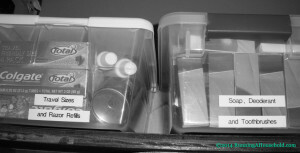 In the back row, we keep our jewelry cleaner and perfume, which are not used as often. This shelf organizer also makes good use of our vertical space. On the shelf, we keep typical bathroom supplies, along with a bin of our Mary Kay supplies. 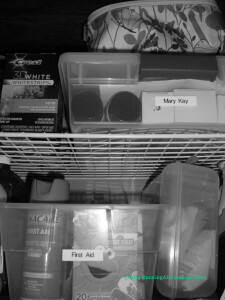 Underneath the shelf, we store our First Aid Supplies. Everything is labeled so it can be found quickly when needed. To the right are some general bathroom cleaners. We keep these on a higher shelf so the kids can’t reach them. We shop the sales and stock up when items cost less money. It also very convenient. When you need a new toothbrush or fresh bar of soap, it’s readily available. We love baby wipes. In fact, my husband insists that we will have them in the house long after our boys have grown up. I used a baby wipe to clean the dust off of bathroom fan. Another baby wipe took care of the dust on the wall sconces. 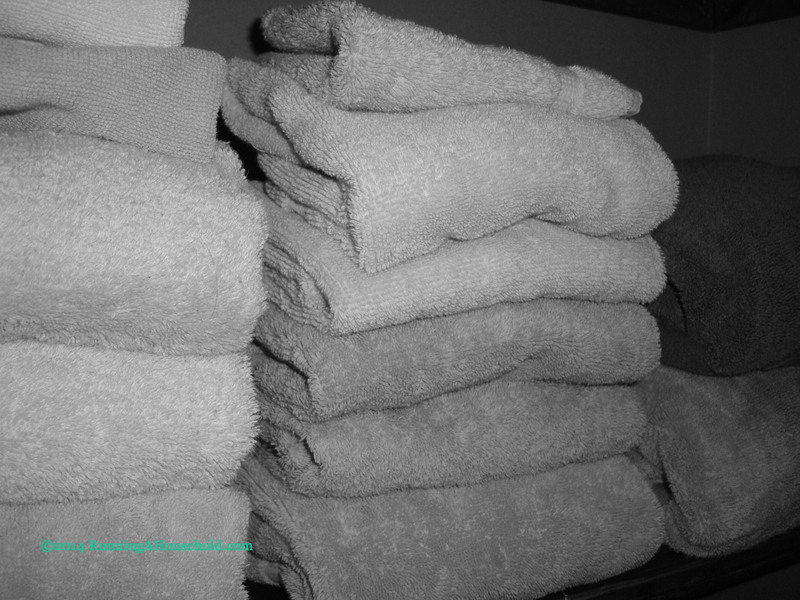 Now that your bathroom is clean and organized, how to you keep it that way? Tip#1: Be sure to label your bins and baskets. This makes it easier to find things, but also encourages you to put things away. Click here to see which label maker we use. Tip #2: Have a weekly cleaning schedule which involves cleaning the bathroom sink, mirrors, toilet, tub and floor. 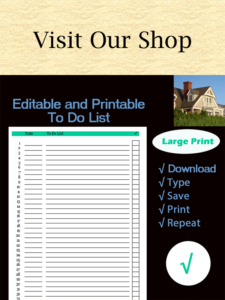 Click here to see our printable Household Chores – Weekly Checklist. Tip #3: Be sure to follow a Spring and Fall Cleaning Schedule every 6 months. 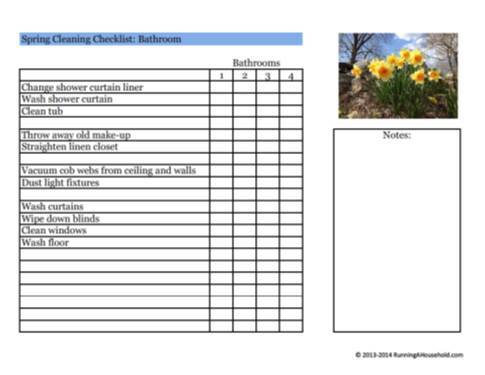 Click here to print copies of our Spring and Fall Cleaning Checklists – Room by Room. 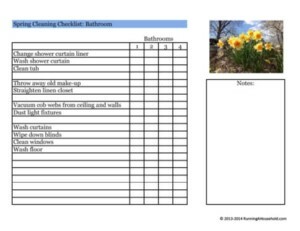 There’s a special checklist just for the bathroom. 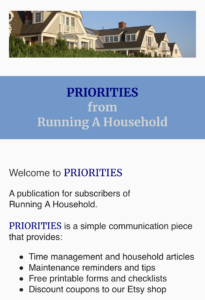 This entry was posted in Organization and tagged fall cleaning bathroom, how to organize your bathroom, organization ideas bathroom, organize bathroom, spring cleaning bathroom on April 4, 2014 by Running A Household.